Whether it's delivering new experiences through mobile apps, building a platform to power a partner ecosystem, or modernizing IT systems, virtually every modern business uses APIs (application programming interfaces). Google Cloud’s Apigee API platform helps enterprises adapt by giving them control and visibility into the APIs that connect applications and data across the enterprise and across clouds. It enables organizations to deliver connected experiences, create operational efficiencies, and unlock the power of their data. As enterprise API programs gain traction, organizations are looking to ensure that they can seamlessly connect data and applications, across multi-cloud and hybrid environments, with secure, manageable and monetizable APIs. They also need to empower developers to quickly build and deliver API products and applications that give customers, partners, and employees secure, seamless experiences. We are making several announcements today to help enterprises do just that. Thanks to a new partnership with Informatica, a leading integration-platform-as-a-service (iPaaS) provider, we’re making it easier to connect and orchestrate data services and applications, across cloud and on-premise environments, using Informatica Integration Cloud for Apigee. 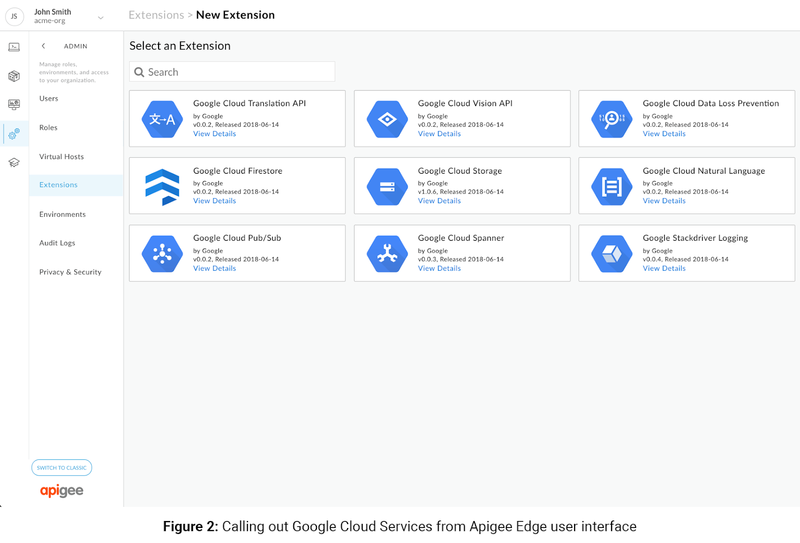 We’ve also made it easier for API developers to access Google Cloud services via the Apigee Edge platform. We believe that for an enterprise to accelerate digital transformation, it needs API developers to focus on business-impacting programs rather than low-level tasks such as coding, rebuilding point-to-point integrations, and managing secrets and keys. 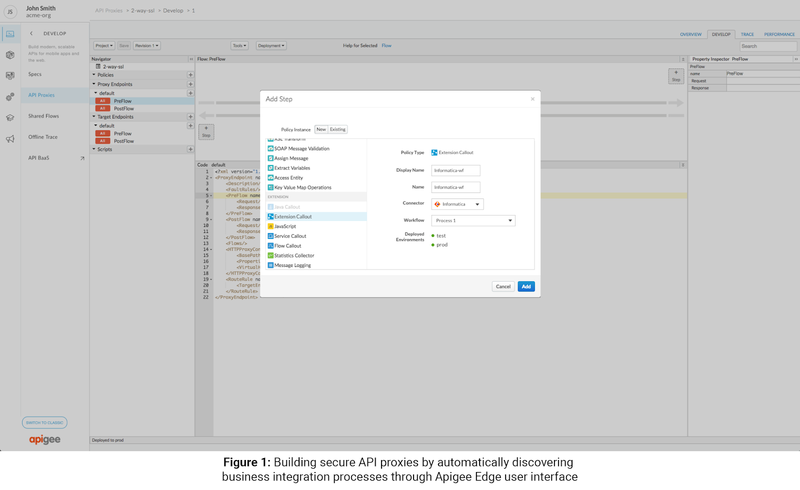 From the Apigee Edge user interface, developers can now use policies to discover and invoke business integration processes that are defined in Informatica’s Integration Cloud. Using this feature, an API developer can add a callout policy inside an API proxy that invokes the required Informatica business integration process. This is especially useful when the business integration process needs to be invoked before the request gets routed to the configured backend target. API developers want to easily access and connect with Google Cloud services like Cloud Firestore, Cloud Pub/Sub, Cloud Storage, and Cloud Spanner. In each case, there are a few steps to perform to deal with security, data formats, request/response transformation, and even wire protocols for those systems. Apigee Edge includes a new feature that simplifies interacting with these services and enables connectivity to them through a first-class policy interface that an API developer can simply pick from the policy palette and use. Once configured, these can be reused across all API proxies. We’re working to expand this feature to cover more Google Cloud services. Simultaneously, we’re working with Informatica to include connections to other software-as-a-service (SaaS) applications and legacy services like hosted databases. Integration architects, working to connect data and applications across the enterprise, play an important role in packaging and publishing business integration processes as great API products. Working with Informatica, we’ve made this possible within Informatica’s Integration Cloud. 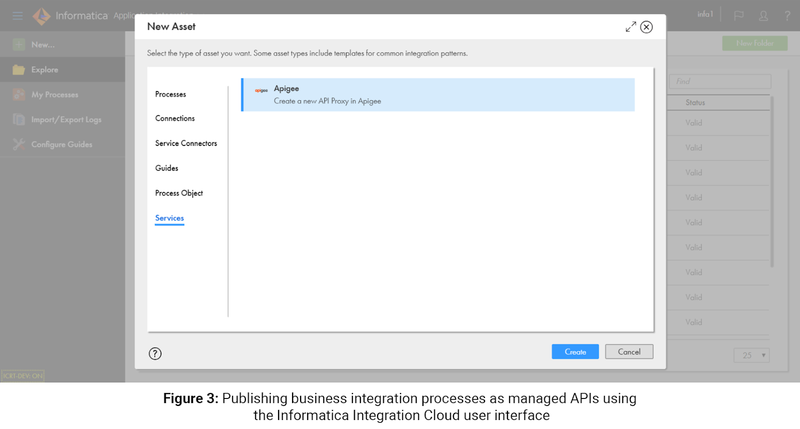 Integration architects that use Informatica's Integration Cloud for Apigee can now author composite services using business integration processes to orchestrate data services and applications, and directly publish them as managed APIs to Apigee Edge. This pattern is useful when the final destination of the API call is an Informatica business integration process. Apply additional policies to the generated API proxy by logging in to the Apigee Edge user interface. API documentation can be generated and published on a developer portal, and the API endpoint can be shared with app developers and partners. APIs are an increasingly central part of organizations’ digital strategy. By working with Informatica, we hope to make APIs even more powerful and pervasive. Click here for more on our partnership with Informatica.